The team won 75 games and lost 79 as they scored 602 runs and allowed 595. The player manager was Kid Nichols and the games were played at Robinson Field. The Attendance for the year was 386,750 which made them the 4th highest out of 8 teams. Before the 1904 season starts, the Cardinals go out and get a big bat from Cincinnati as they purchase Jack Beckley and his 2,501 hits. He plays four more years for St. Louis and only manages 429 more hits. Beckley led the team with a .325 batting average with 67 runs batted in, however, Dave Brain had the most RBI’s as a regular sub with 72. Mike Grady had a .313 average along with leading the team in home runs with 5. Jack Taylor and Kid Nichols led the pitching staff with 20 or more wins and an ERA near 2.20 for the season. 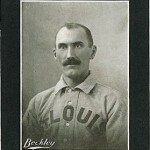 The league changes the schedule from 140 to 154 games as the Cardinals pick up pitcher Charles (“Kid”) Nichols who had spent twelve season with Boston. and name him player-manager. Now 34 yrs-old, he is able to win 21 games. He lost his manager position in July to third baseman Jimmy Burke. The owner, Frank Robison, begins to get bored with the ownership and allows his brother Stanley to assume more leadership in the team decisions. But it was well known that he really had very little knowledge about baseball. Jack Taylor, whom they got in the off-season, reels off 39 straight complete games for a National League record. During the season, Giants pitcher Christy Mathewson beats the Cardinals six times and goes on to notch 24 consecutive wins over St. Louis. He leads the NL with 33 wins and the most strikeouts. The team improved dramatically with a 75-79 record but still are 31.5 games behind the league leading New York Giants for a 5th place finish. Here are the uniforms used by the Cardinals in 1904. December 20, 1904: The St. Louis Cardinals purchased Jack Warner from the New York Giants. August, 1904: The St. Louis Cardinals purchased Charlie Swindells from Butte (Pacific National). August, 1904: Baltimore (Eastern) purchased Bill Byers from the St. Louis Cardinals. August, 1904: The St. Louis Cardinals purchased John Butler from Kansas City (American Association). February 11, 1904: The St. Louis Cardinals purchased Jake Beckley from the Cincinnati Reds. Here is the players that started the most times at each position.